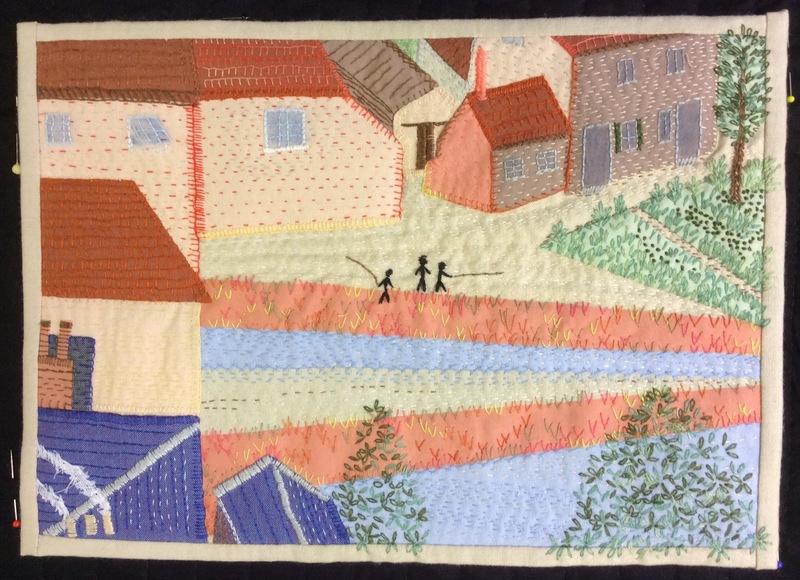 Last year I made a little 20 x 30 cm riverside quilt as part of the Hockney Challenge. 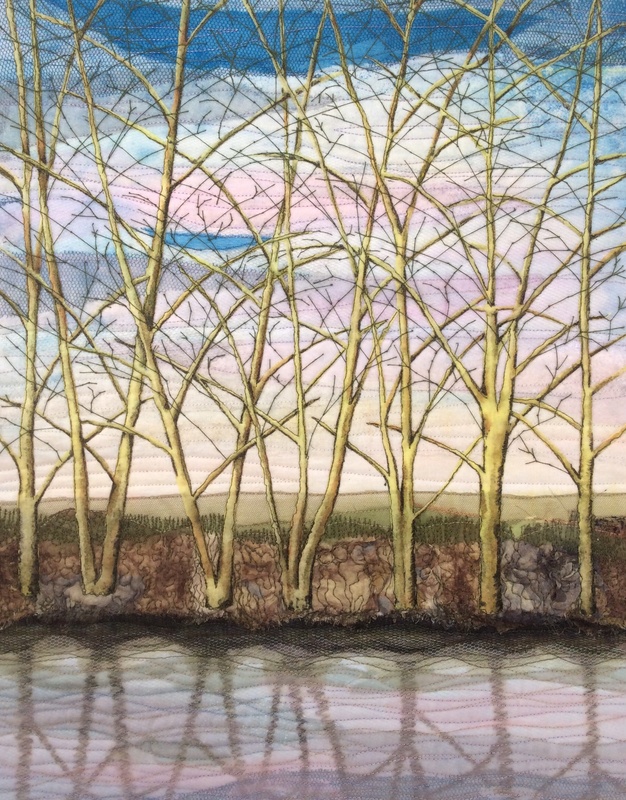 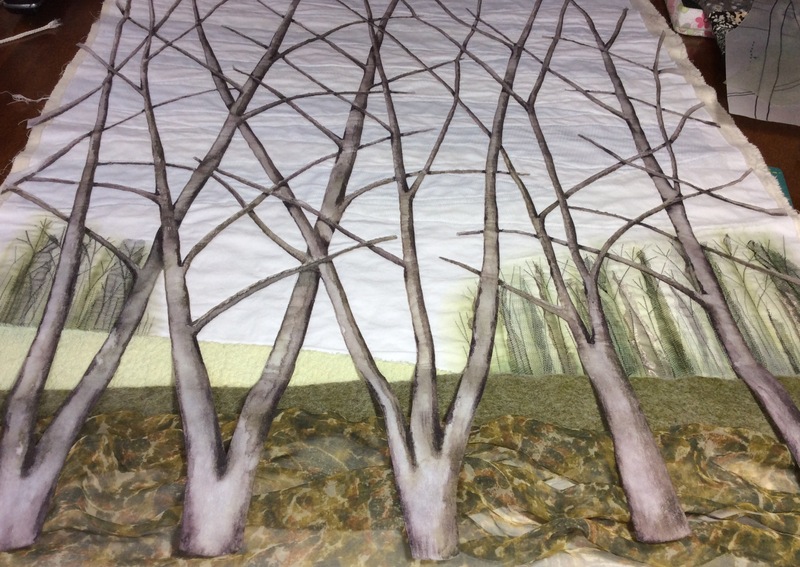 Overall I was happy with it but, 18 months on and feeling more confident, I thought it would be a good exercise to revisit the design and make a larger version…….. Riverside Trees II. 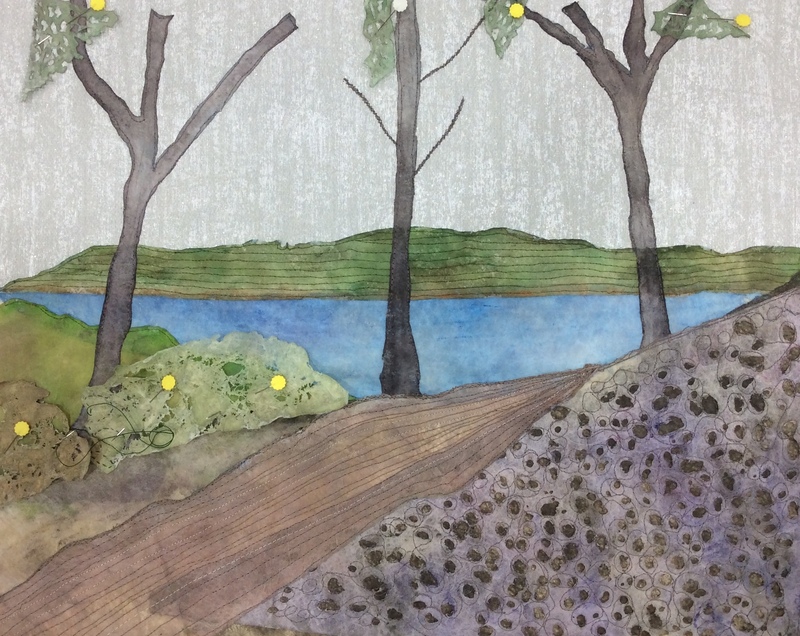 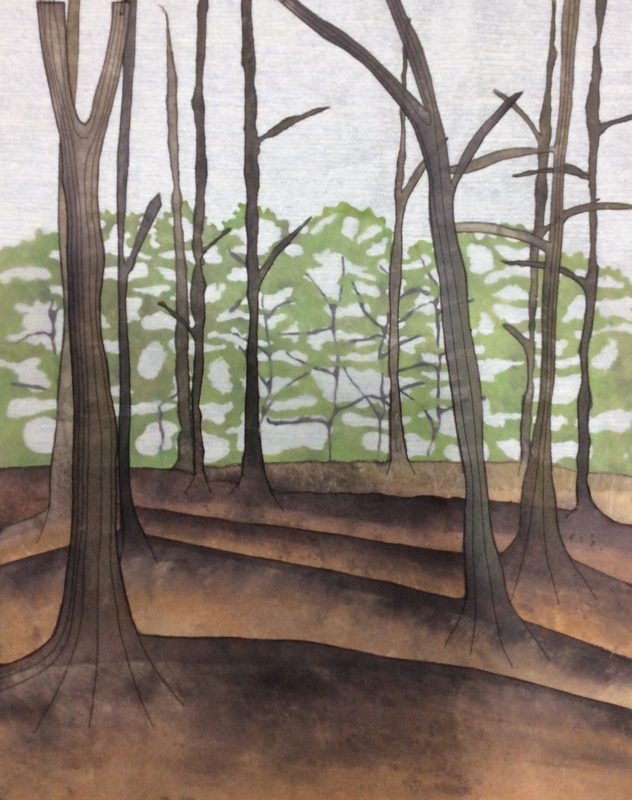 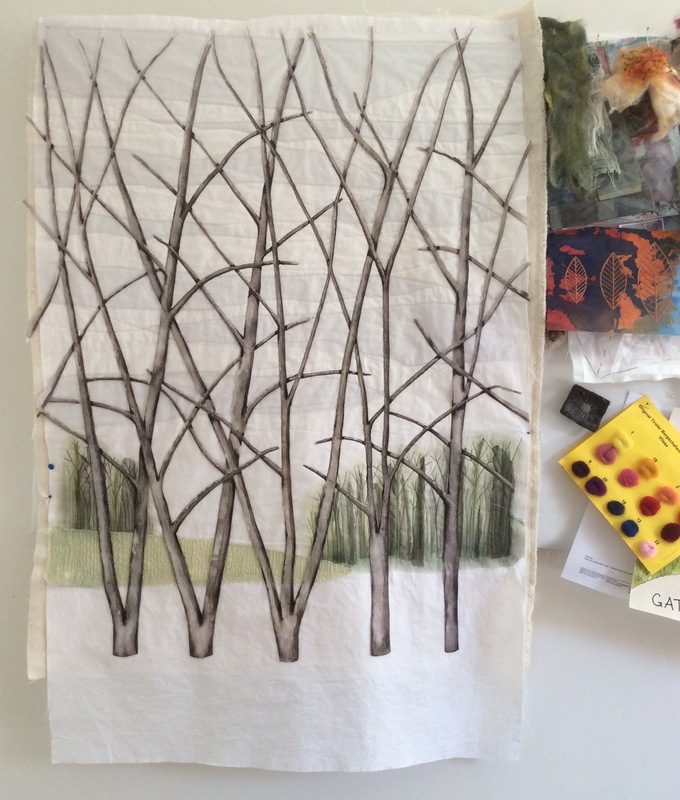 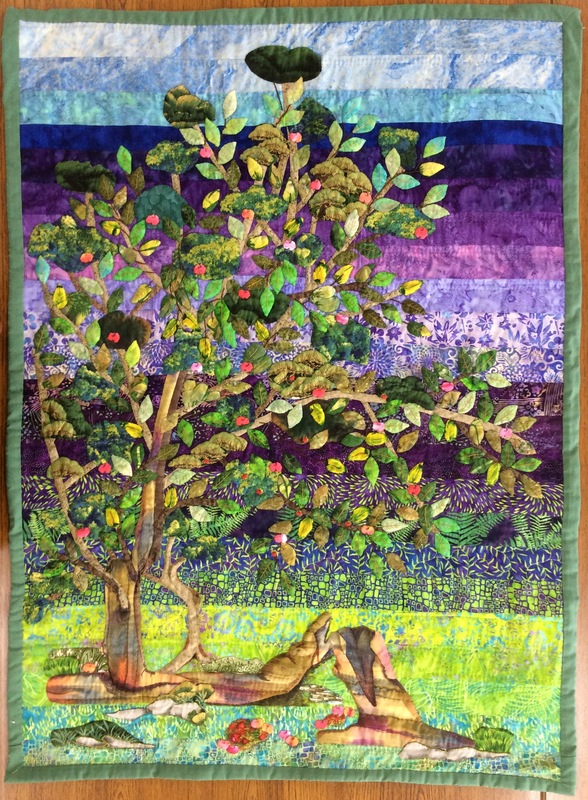 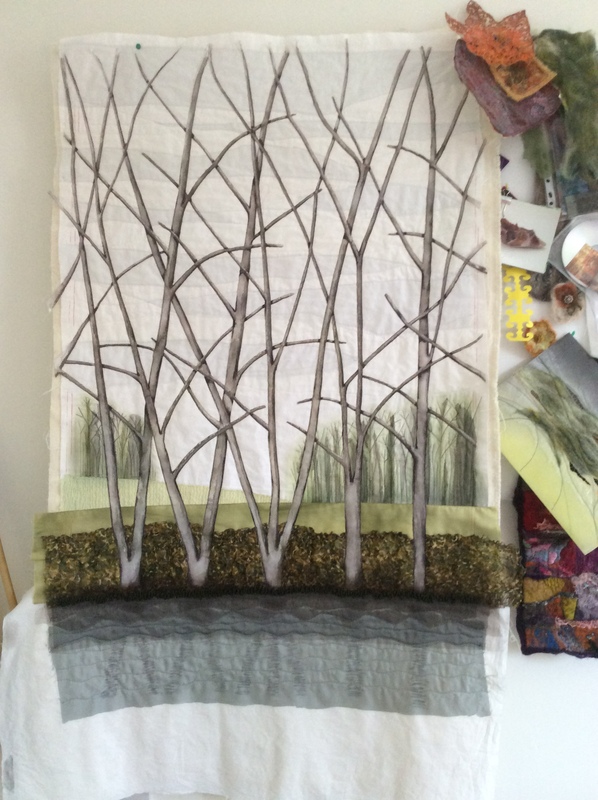 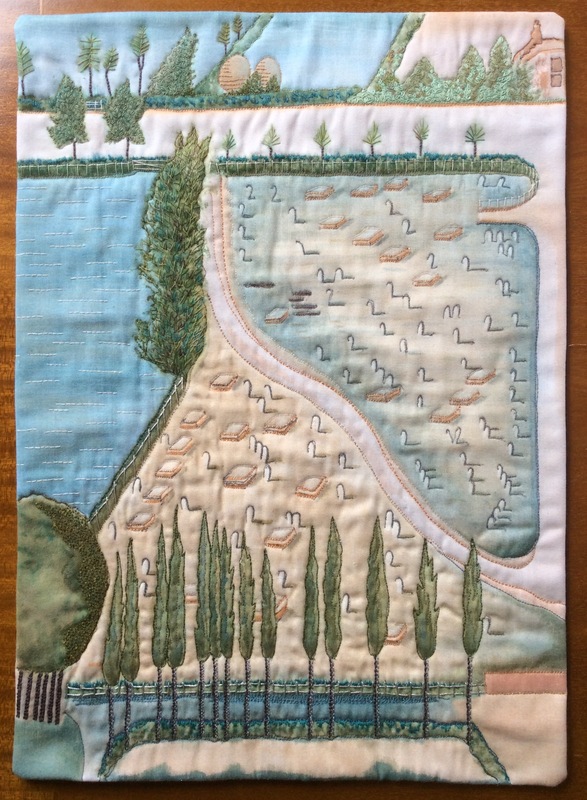 This quilt is 68 x 108 cm and I’ve aimed to give the scene more depth by placing forests in the background and a near side bank with dried grasses in the foreground. 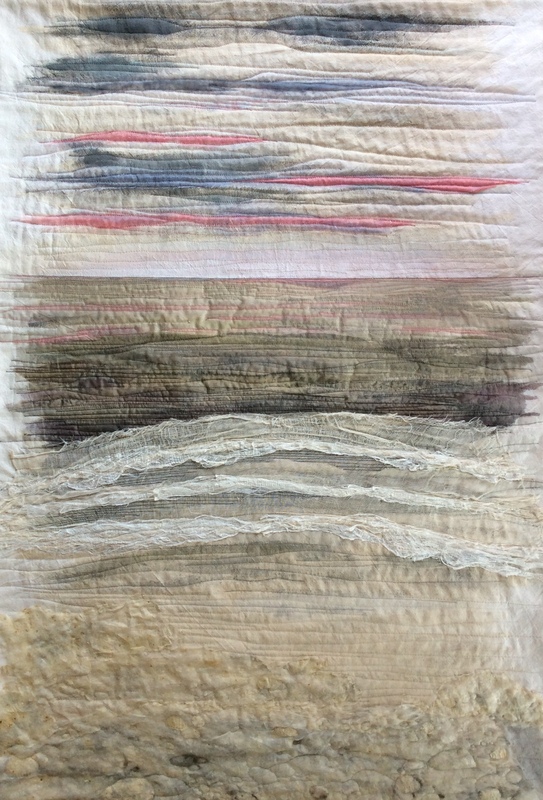 The colour of the sky was too dominant first time round so I’ve made it subtle and gone for texture rather than colour this time. 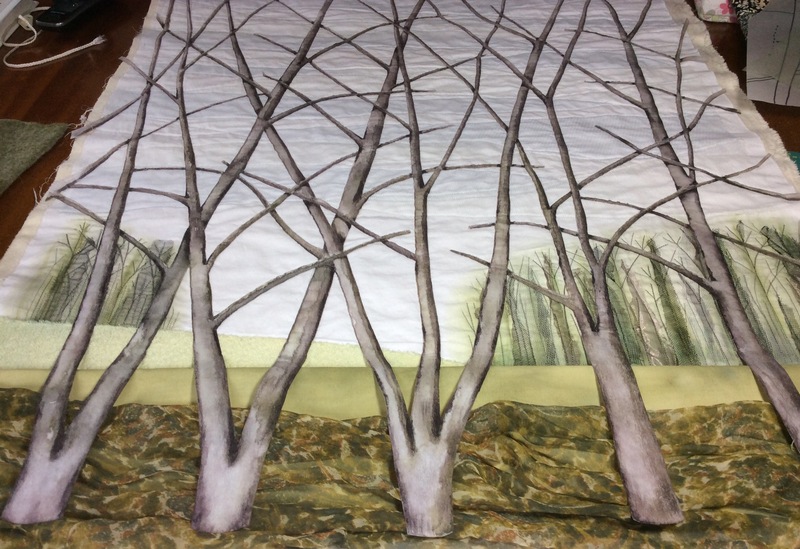 The trees are pretty much the same as previously but I felt the original version was too fussy so I’ve reduced their number from 7 to five and left off the smaller branches. 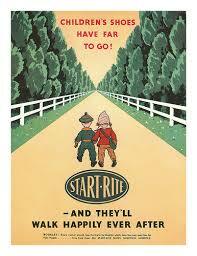 I think this has created a stronger overall image. 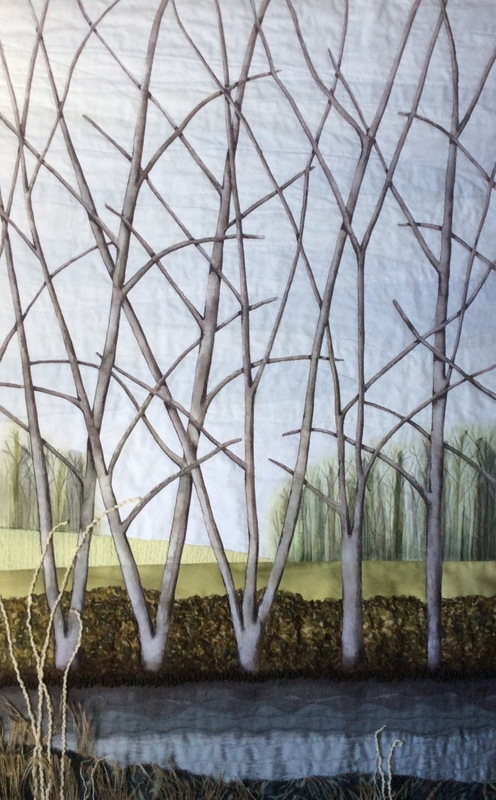 With this one finished I’m going to concentrate on my sketch book over the next couple of weeks and work on some new designs. 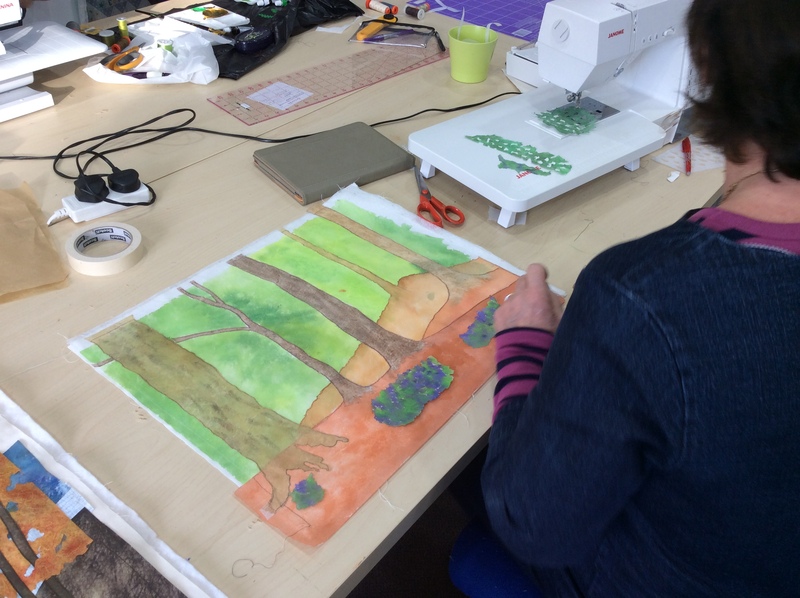 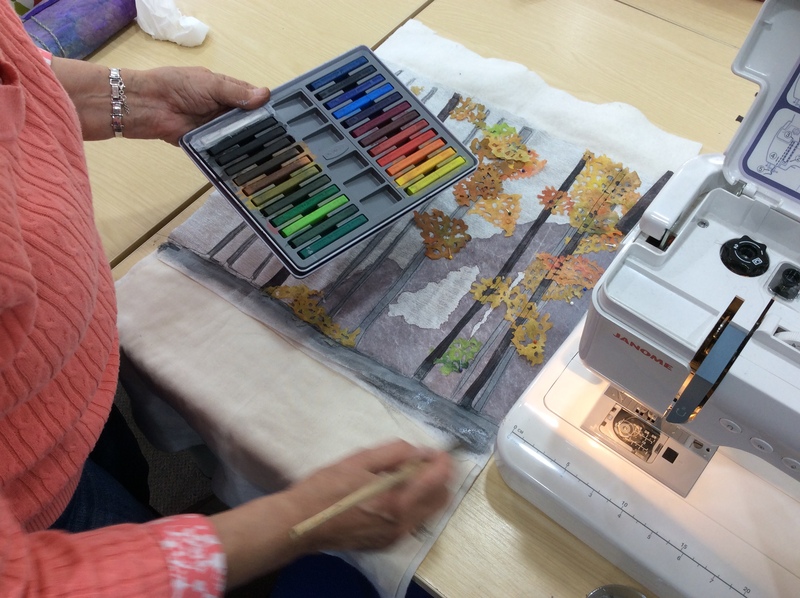 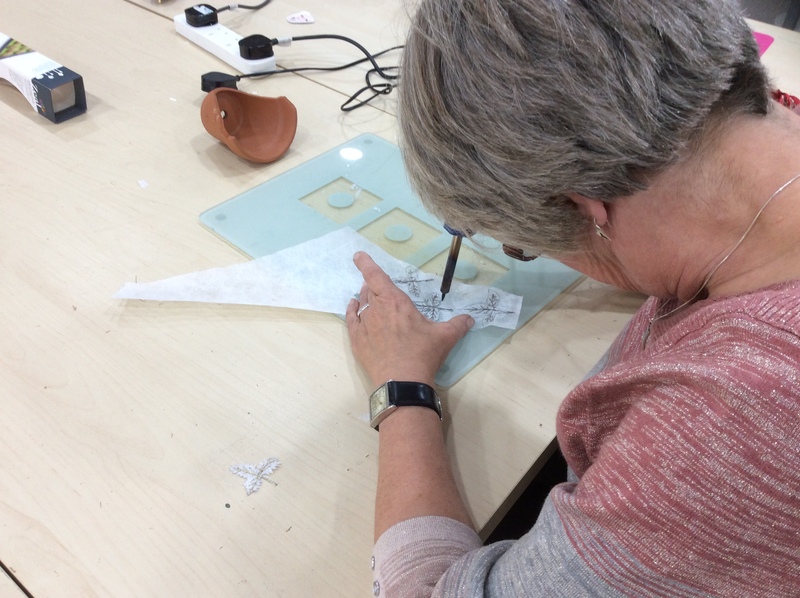 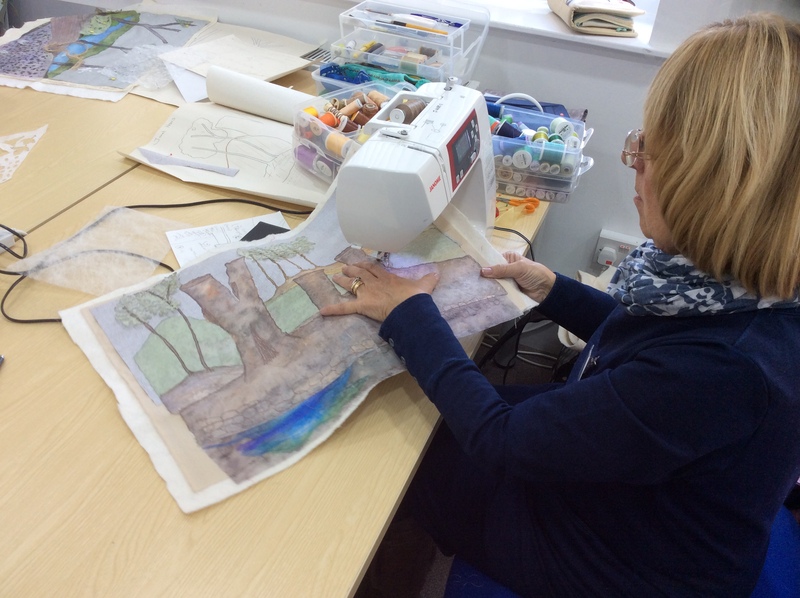 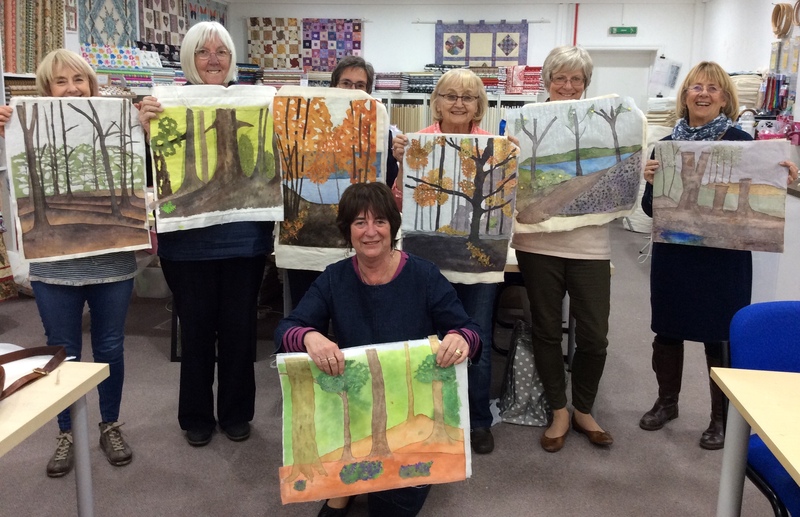 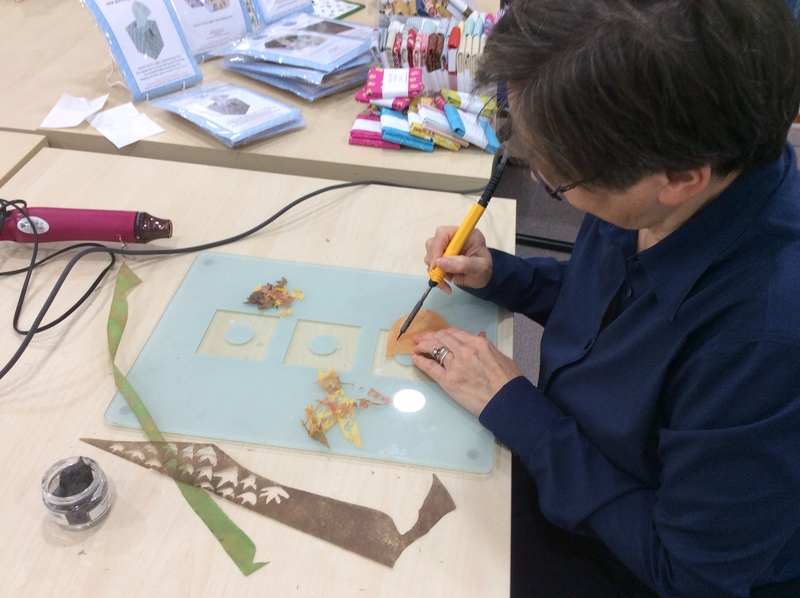 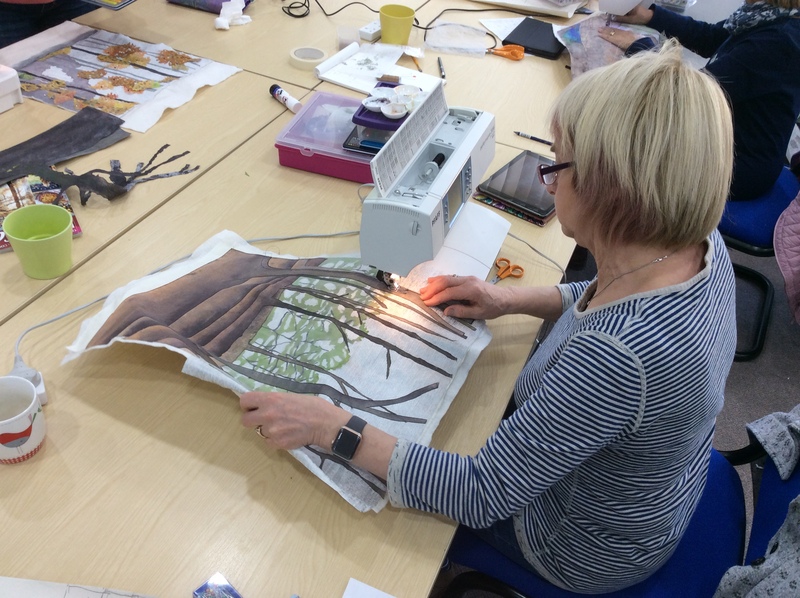 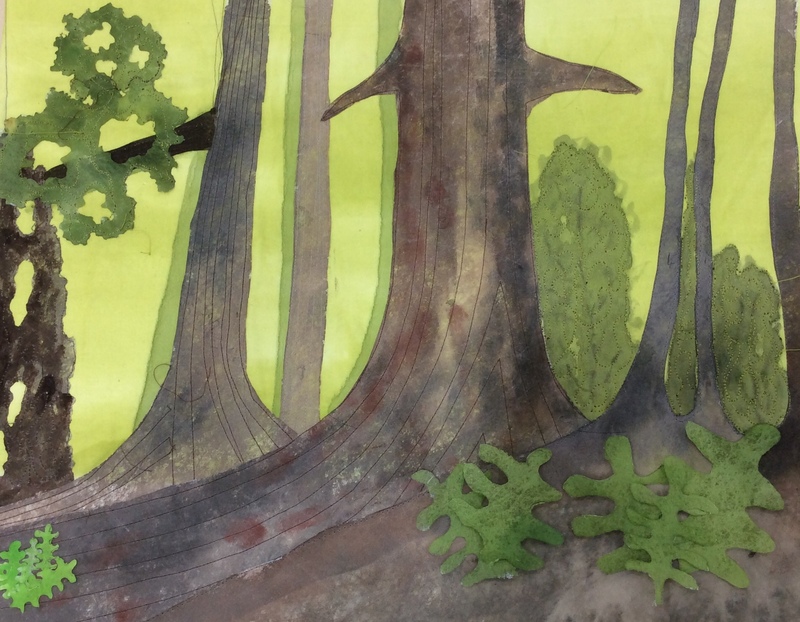 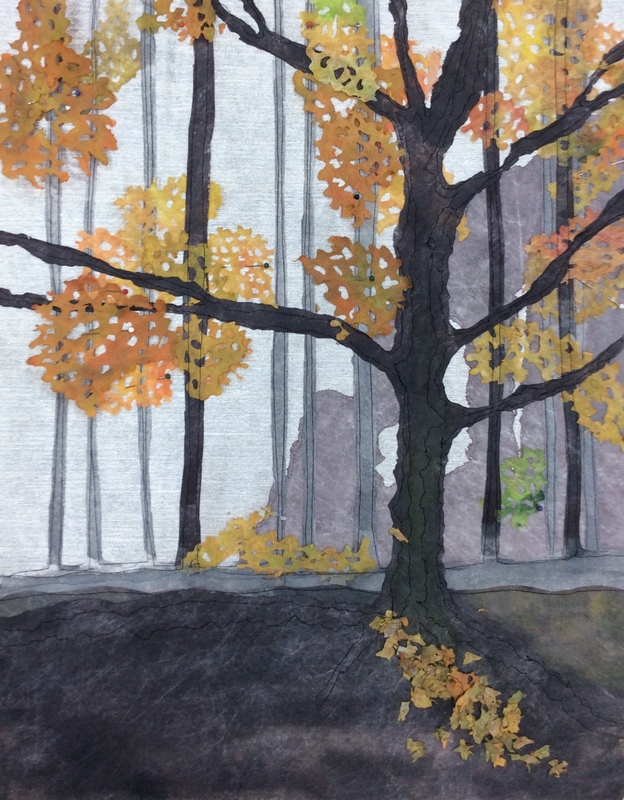 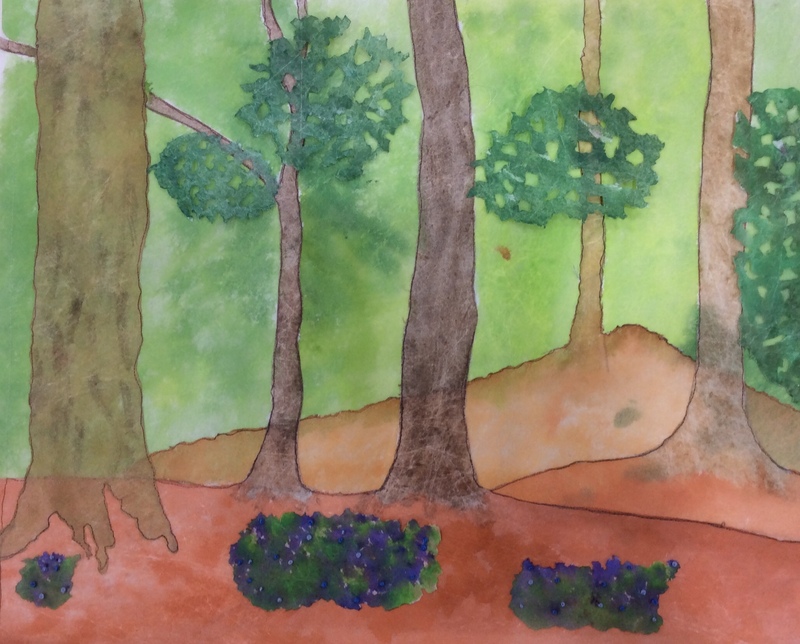 The latest quilt challenge to be drawn out of the hat at Cranwell is to produce a piece with the theme “a walk in the Black Forest” so that will be right up my street! 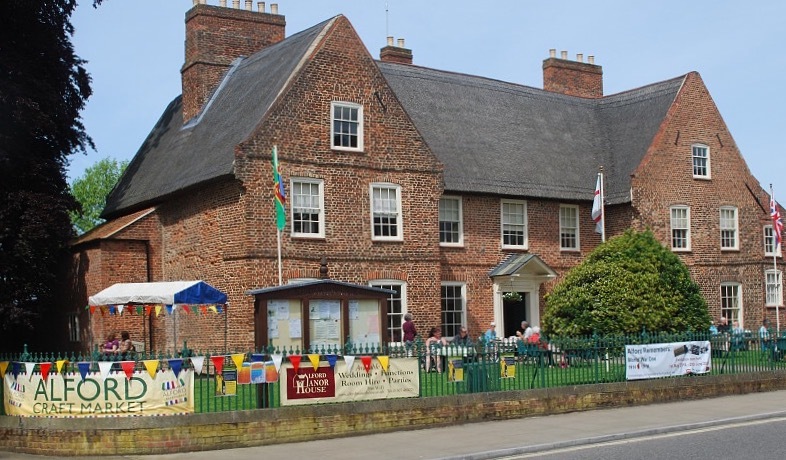 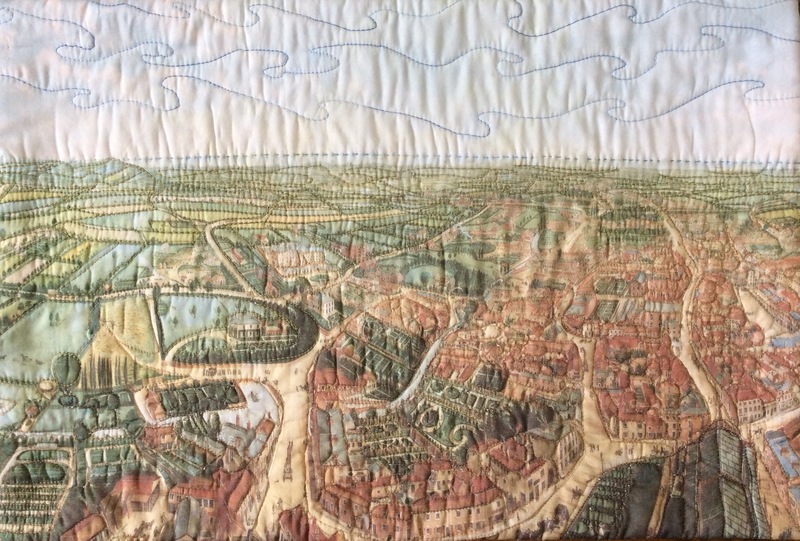 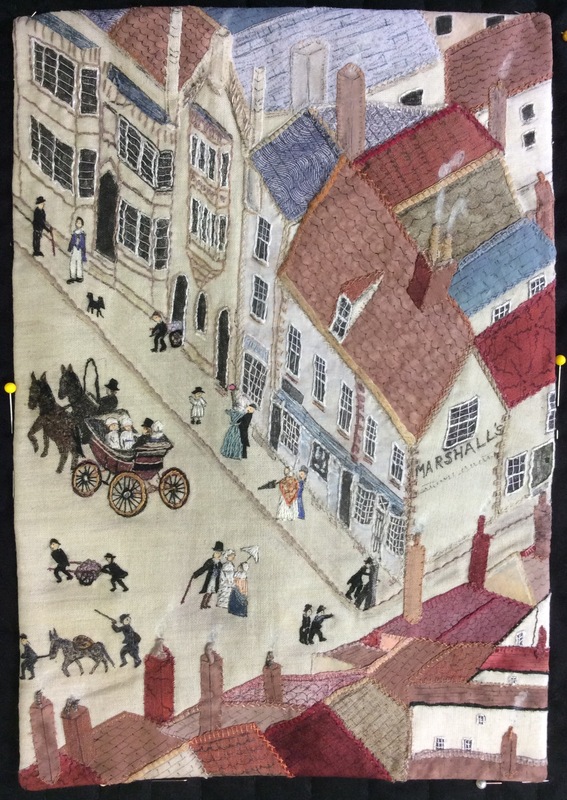 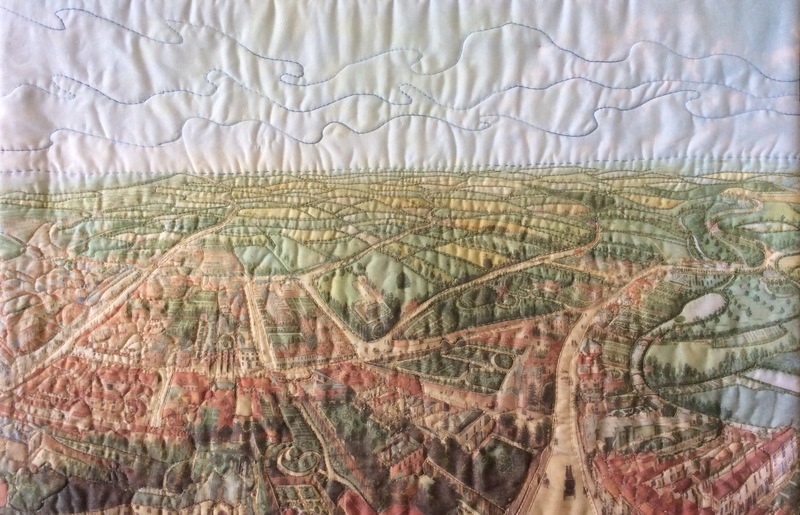 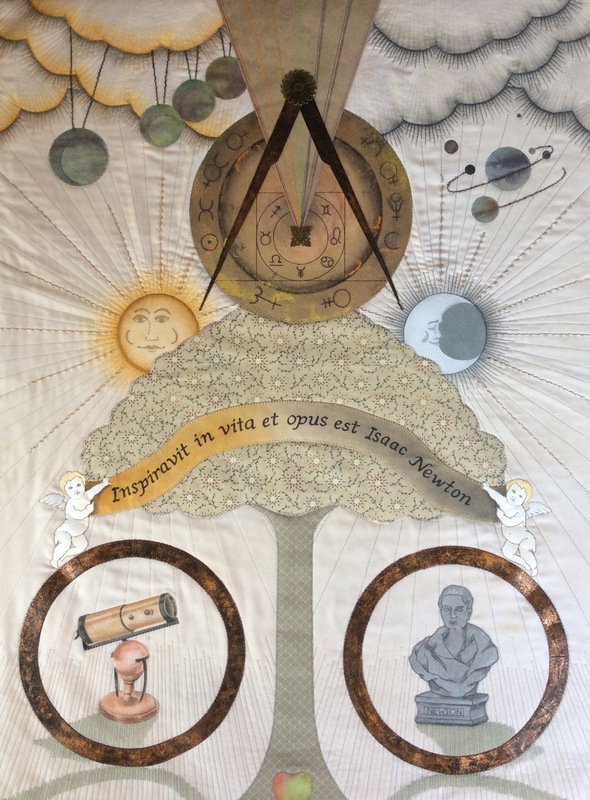 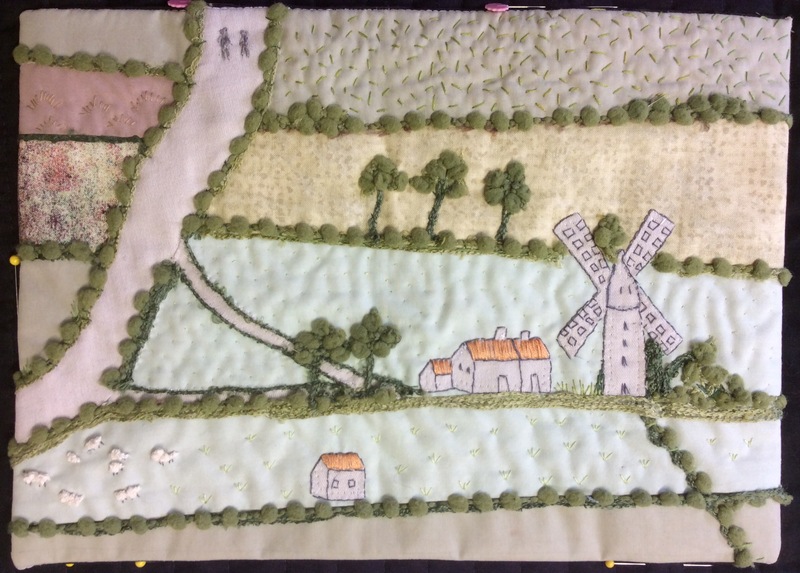 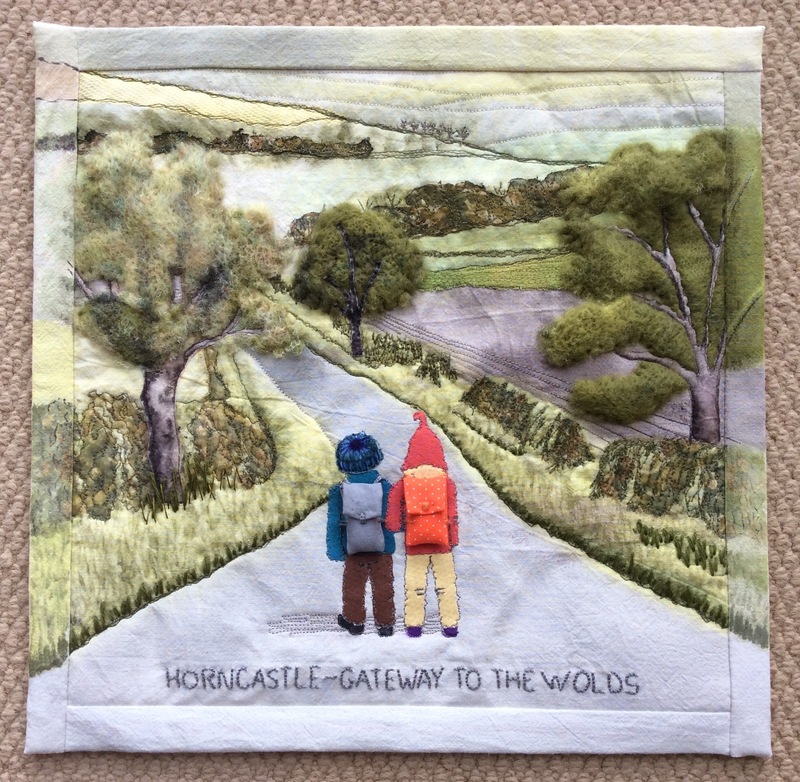 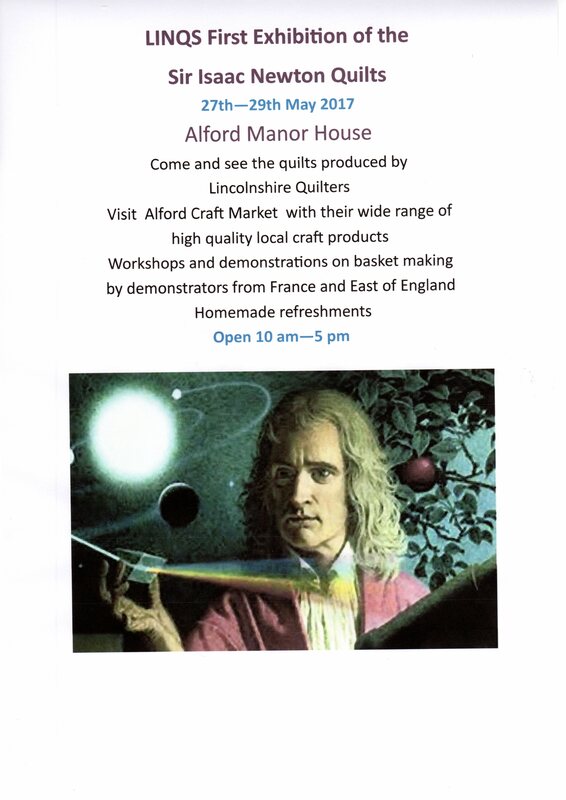 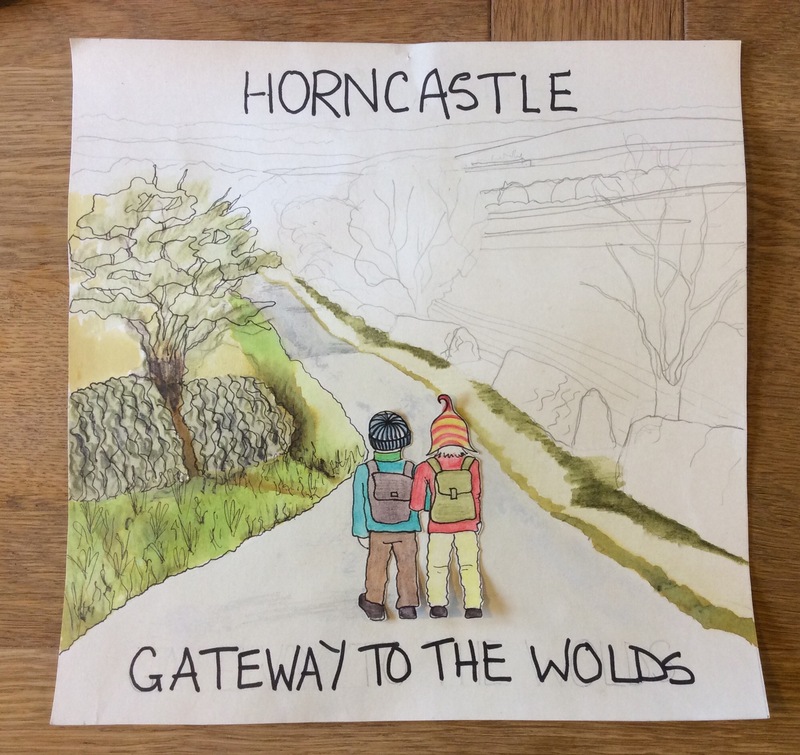 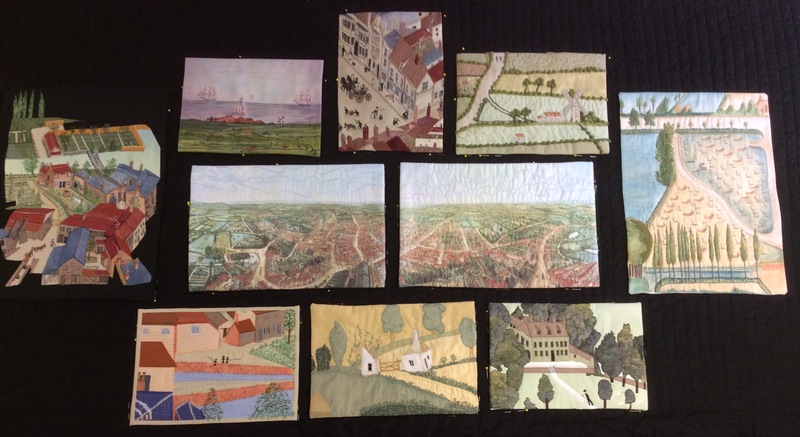 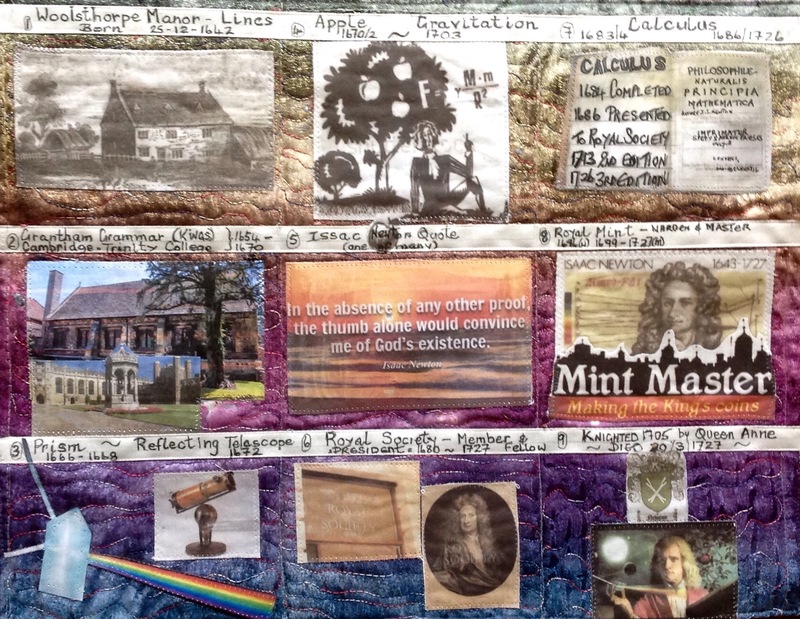 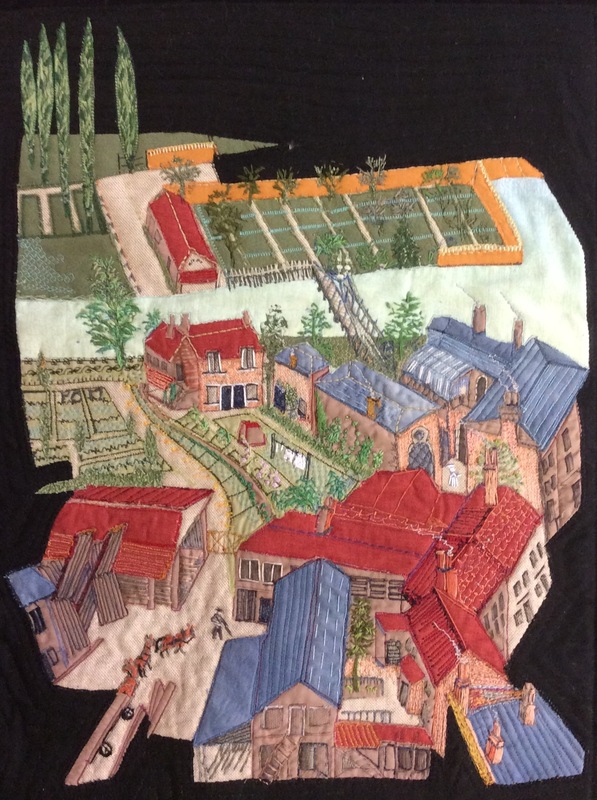 Horncastle – Gateway to the Wolds…..
I’ve just completed a commissioned quilt, entitled Horncastle – Gateway to the Wolds, for the local branch of the WAW (Walkers are Welcome). 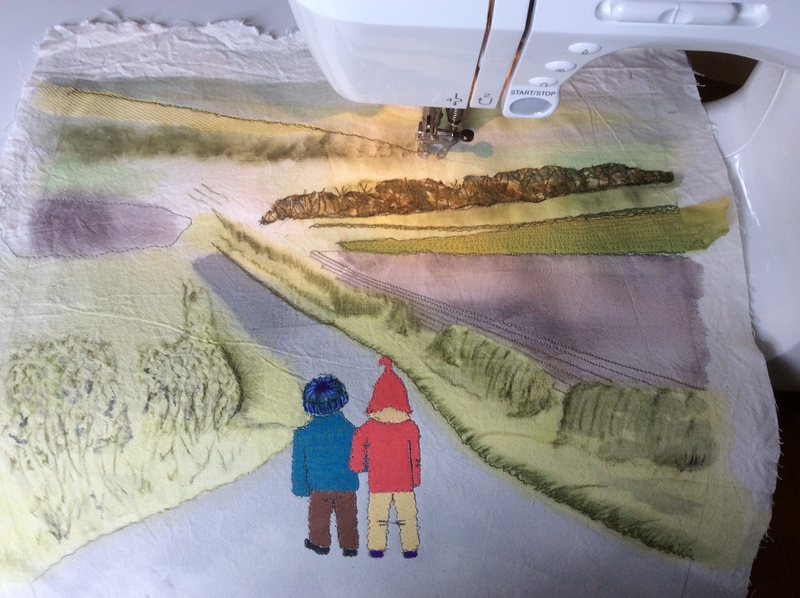 The two characters in my design are based on the twins from the old Start-Rite children’s shoe advert, but in this case they are carrying backpacks and are walking in the Lincolnshire Wolds. 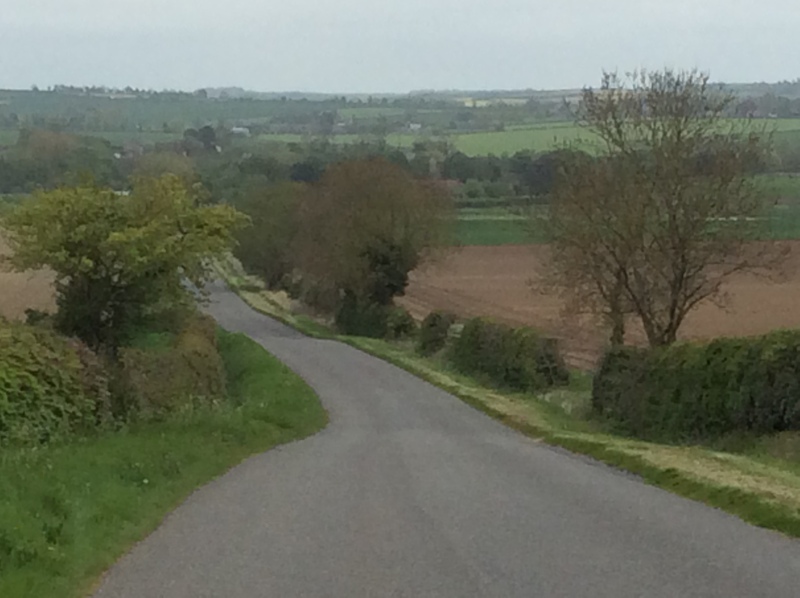 After taking several photographs of the local landscape I chose the view which was taken just outside of Horncastle, with my back to the A158, looking across towards the Wolds and towards the village of West Ashby. 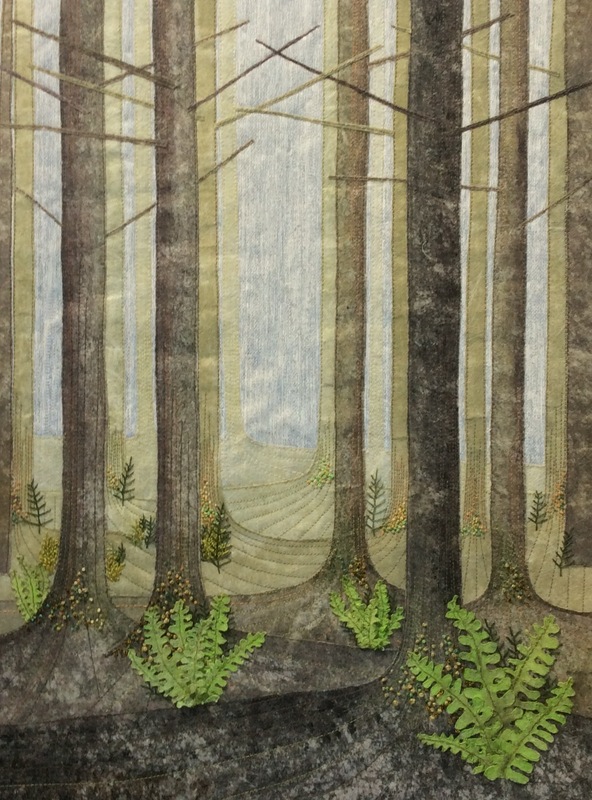 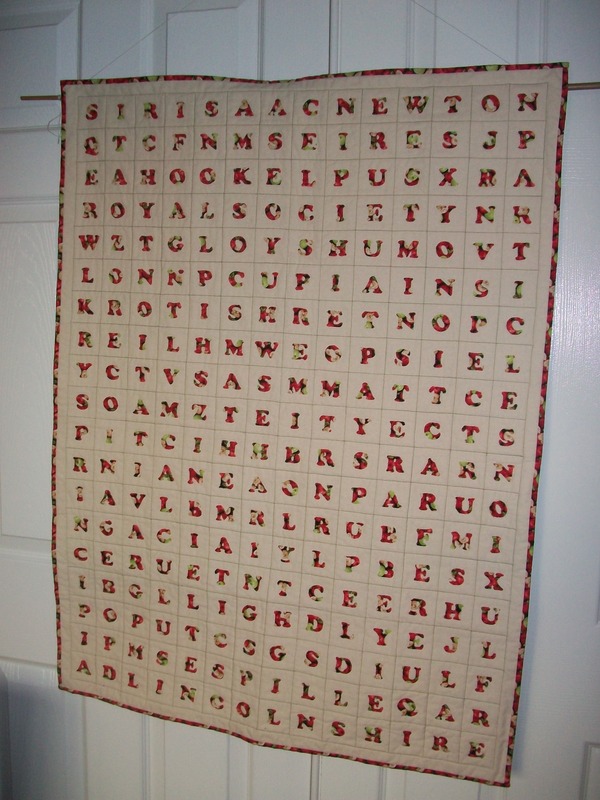 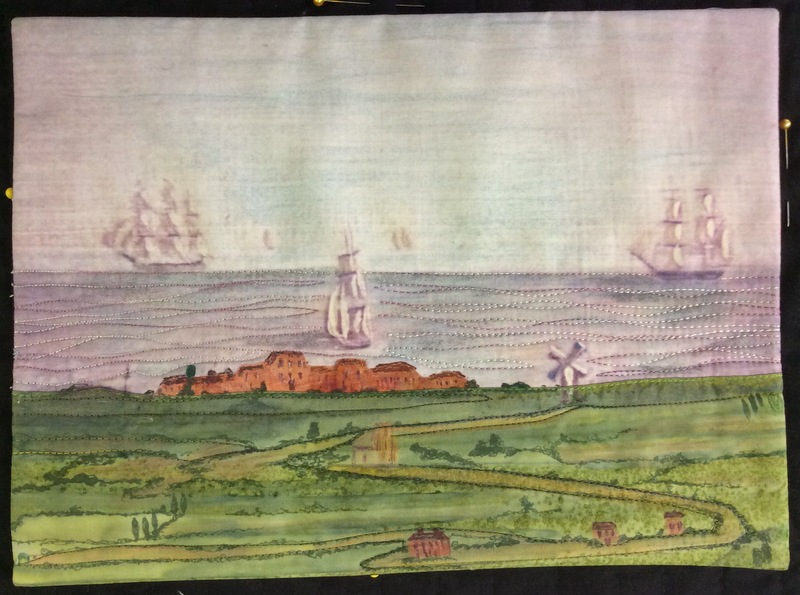 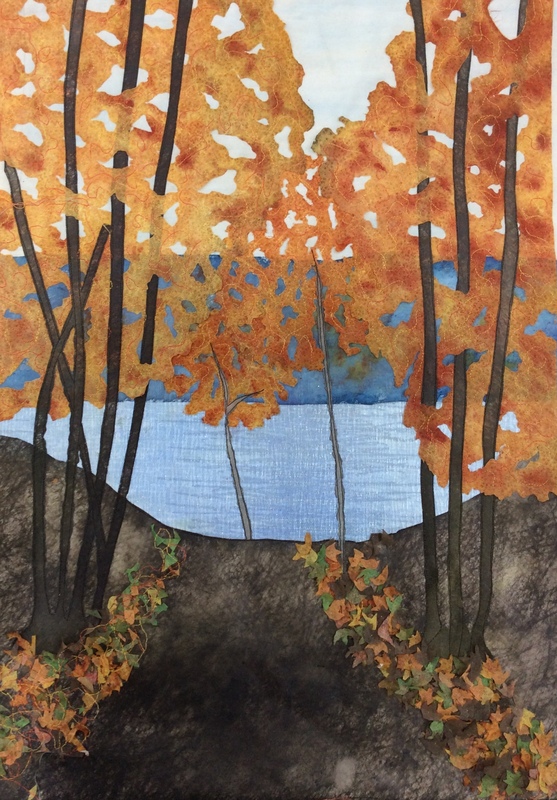 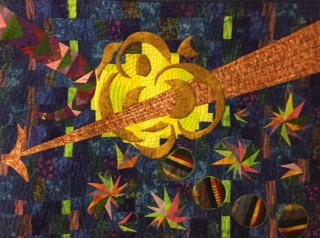 The 30 x 30 cm quilt combines several techniques including the use of Inktense pencils to draw and colour the background scenery. 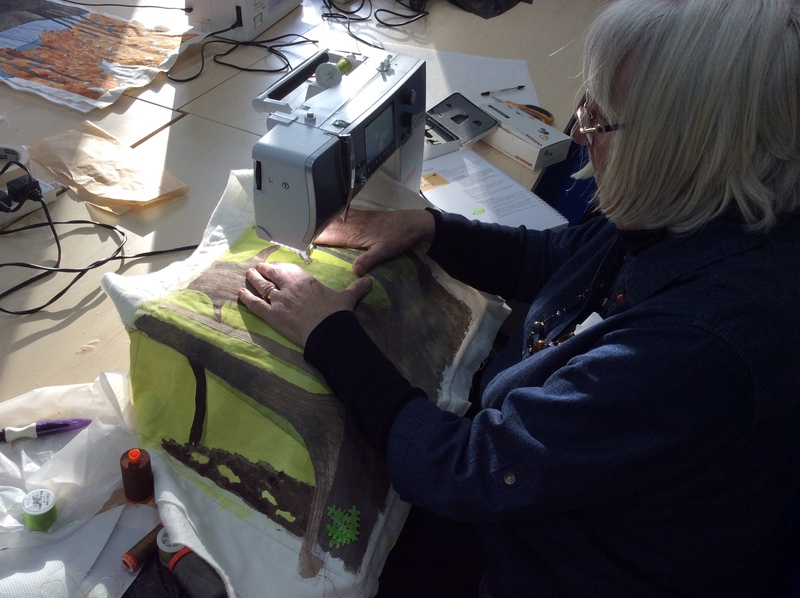 The twins are applique with 3D backpacks. 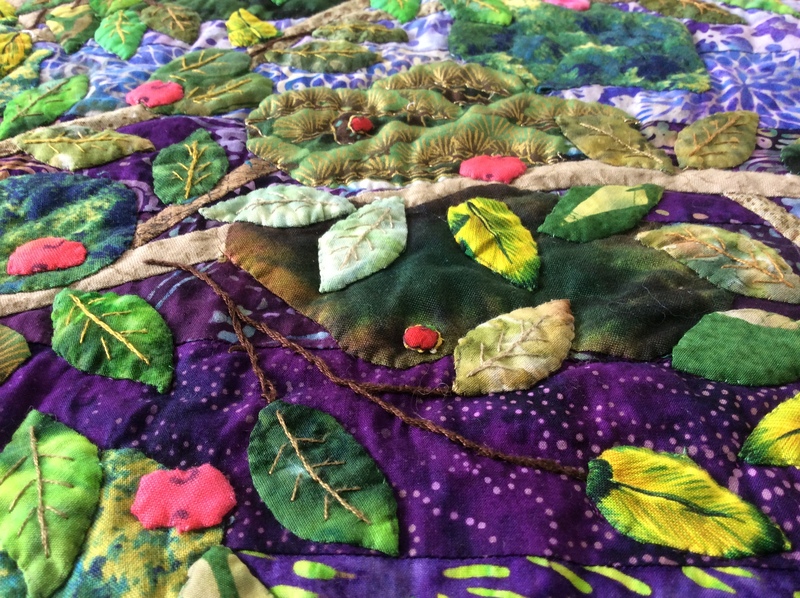 The trees have vilene trunks and needle felted foliage created using the embellisher machine. 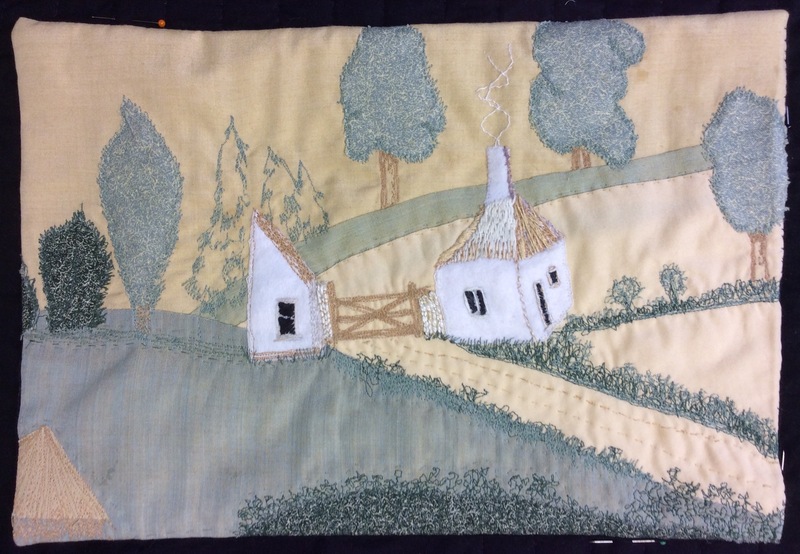 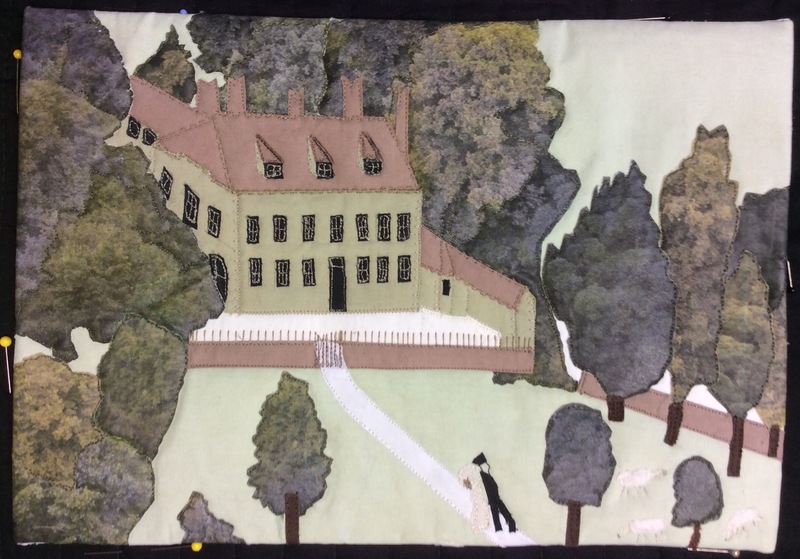 The hedgerows were made from a lightweight scarf which was distressed using a heat gun while the stitching is a combination of hand and machine embroidery. 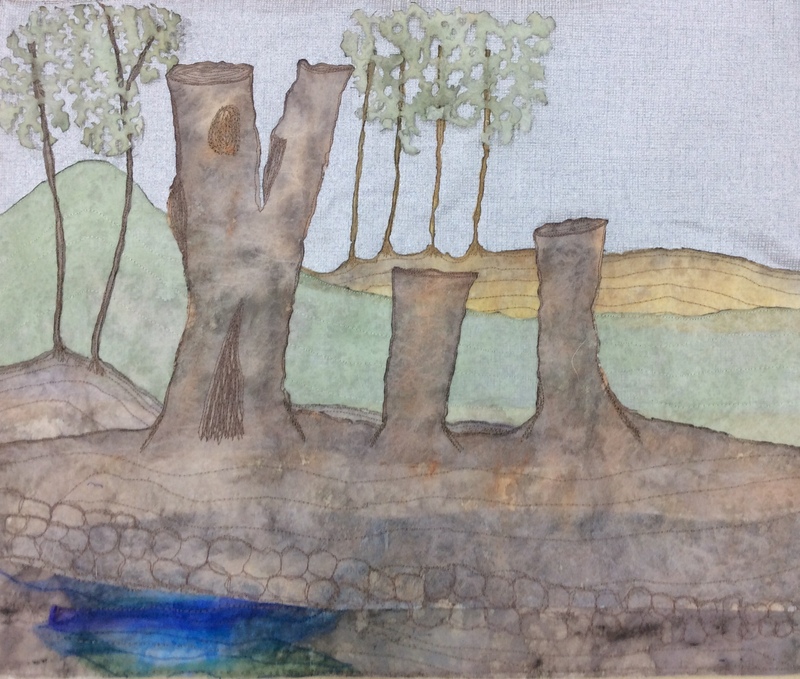 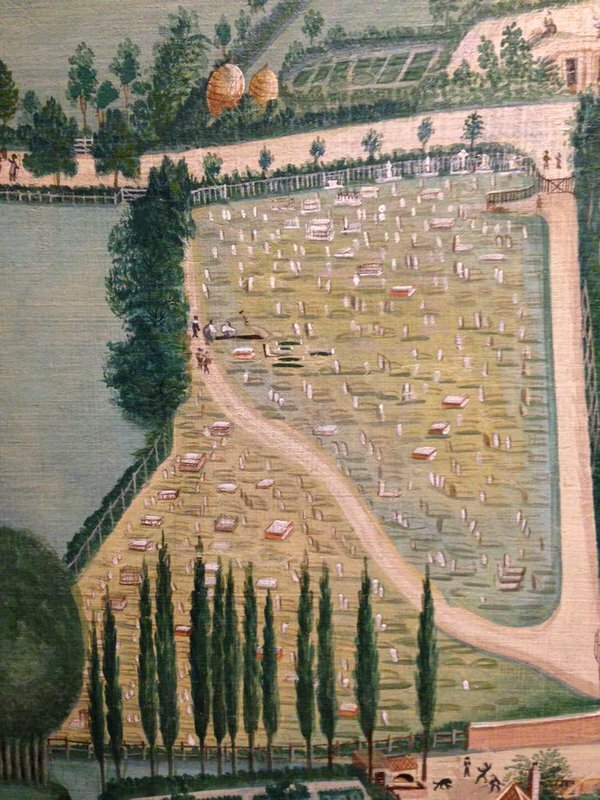 I’m not a fan of borders so, as the brief was to include a border, I’ve painted it to make it an extension of the main image.